This three-pound Kurobuta Mini Karver lets you sample the delights of what some call the world’s greatest ham. All ham photography courtesy Snake River Farms. 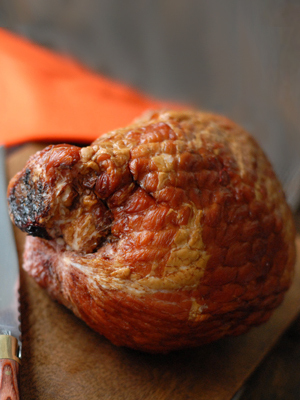 WHAT IT IS: Top-quality ham from the Berkshire pig, a heritage breed. Many people call it “the world’s best ham.” We haven’t had all of the world’s great hams, but this one is pretty special. WHY IT’S DIFFERENT: Like Kobe beef, Kurobuta pork has a much higher percentage of intramuscular fat to lean, making it more succulent and tender. WHY WE LOVE IT: Melt-in-your-mouth flesh and flavor, and not salty. WHERE TO BUY IT: SnakeRiverFarms.com. Pork Section, with recipes and more. 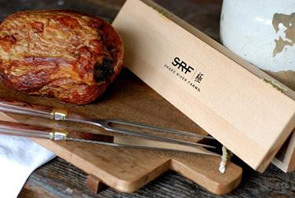 Gift Set: Mini Karver with carving knife and fork. REVIEW: Just about everyone has heard of Kobe beef. But how many people know Kurobuta* pork, the porcine equivalent? You can sample this superior ham—some call it the world’s best ham—in a three-pound Mini Karver from Snake River Farms, producer of Kurobuta pork products. As with Kobe beef, the higher fat content means you shouldn’t eat it as a staple (although only the very wealthy can afford it as such). But for a special occasion, you can afford to go whole hog. For Easter, a Kurobuta Mini Karver serves four as an entrée. A larger crowd can enjoy the ham as an hors d’oeuvre (on a slice of baguette with mustard and snipped chives or sprouts), a first course (such as a slice served with a baby greens salad) or alongside the lamb or other main course. There’s a bonus of a small ham bone, which you can use to flavor soup, beans and other recipes. *The name means “black hogs ” in Japanese. Like Kobe beef, Kurobuta pork comes from a breed that has more intramuscular marbling, which delivers more flavor, tenderness and juiciness. It has superior taste† and a melt-in-your mouth texture. Consumers are rightfully confused between the terms “Kurobuta,” “American Kurobuta,” “Berkshire” and “Kurobuta Berkshire.” What’s the difference? Nothing: It’s all marketing, and unfortunately it’s a type of marketing that confuses the consumer. 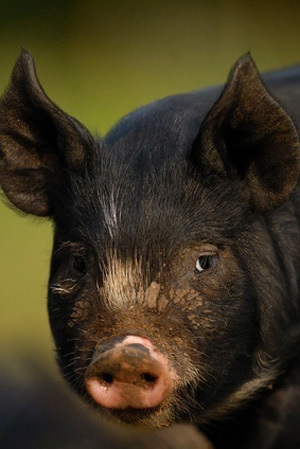 Kurobuta is the Japanese breed name of the Berkshire pig, which originated in England. “American Kurobuta” and “Kurobuta Berkshire” are an attempt to make the Berkshire breed—already known for its superior qualities—seem more exotic and thus even more appealing. Kurobuta pork is analogous to Kobe beef, in that the meat is marbled with small, fine streaks of fat that make each slice sweet, tender, rich and succulent. The juiciness comes from both the fat and the higher PH of the meat. Unlike traditional white pork (“the other white meat”) that can have a tendency to be bland and dry, Kurobuta pork is much darker in color (pink-hued). 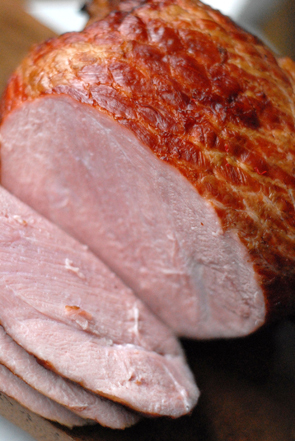 The high fat content makes Kurobuta ham suitable for long cooking and high-temperature cooking. †In a taste test conducted by the National Pork Producers Council, Kurobuta pork ranked #1 in 19 of 25 quality traits, including tenderness and juiciness. Snake River Farms works with small family farms in the Midwest to raise the finest Kurobuta. The review continues below, with the history of ham. Also check out the article index, below. 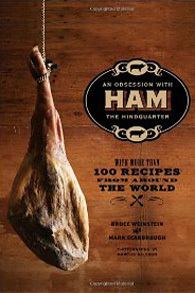 Ham: An Obsession With The Hindquarter, by Bruce Weinstein and Mark Scarbrough. A global tour of ham, anecdotes and 100 ham recipes. More information. Peter Kaminsky. 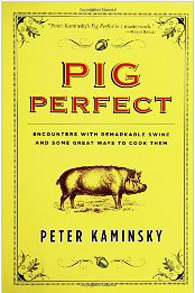 In search of the perfect pig. More information. 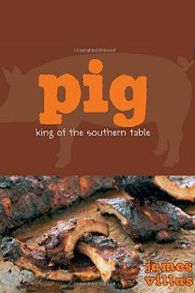 Pig: King of the Southern Table, by James Villas. A generous 300 recipes, guaranteed to have your mouth watering. More information. Reviews, information, recipes and more. Delicious with the Easter ham. Some historians believe that the Chinese cured hams centuries before the meat was even known in Western Europe. The techniques were said to have traveled to Europe along the Silk Road, transforming pork and giving birth to a variety of ham products worldwide. The fame of Berkshire pig, originally bred around the English market towns of Faringdon and Wantage in the county of Berkshire, dates back some 300 years. As the story goes, Oliver Cromwell’s army was in winter quarters in Berkshire during the English Civil War (1642–1651). Provisioners “discovered” the breed and remarked at the superior qualities. A Berkshire pig. Photo © Martin Pateman | Fotolia. Breeding of the Berkshire pig was refined in the early 1800s; today’s pigs descend from the herd maintained by the British monarchy since the early 18th century. The American Berkshire Association, established in 1875, gives pedigrees only to animals directly imported from established English herds or to American descendants of those imported animals. Some Berkshire pigs were sent to Japan as a diplomatic gift, and became known as “Kurobuta,” black hogs—a name which has been trademarked. The Berkshire pig is considered a rare breed because of the limited number of breeding sows worldwide. However, thanks to the growing interest in this fine pork, herds are growing. In addition to commercial breeders, herds are maintained in England by the Rare Breeds Survival Trust and the South of England Rare Breeds Centre. MORE TRIVIA: The treacherous and cunning pig dictator Napoleon in George Orwell's novel Animal Farm is a Berkshire hog. In this great allegorical novella, Napoleon is a stand-in for Joseph Stalin. Learn more about the cuts of pork. Chart courtesy TheHealthyButcher.com. Do you have friends who might enjoy THE NIBBLE?